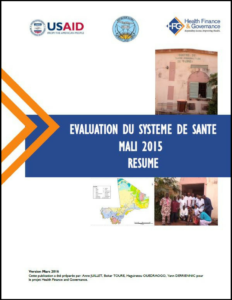 Resource Description: HFG conducted an evaluation of the health system in Mali using the Health Systems Assessment Approach. This evaluation takes place in the context of major reforms in governance, decentralization and budgetary management, and is part of the post-crisis period that Mali experienced in 2012. During this period, the Government of Mali made an effort to refocus on development objectives, based on the MDGs; to reduce population growth, meet the needs of the poor—especially those residing in rural areas—and improve hygiene and public sanitation. The assessment was carried out in two phases; the first phase (October – November 2015) consisted of a thorough review of the literature already available and drafting a preliminary version of the report, and the second phase (December 2015 – March 2016) supplemented the literature review with interviews with all health system stakeholders at the central, regional and operational levels. Principal findings and recommendations are based on indicators of the six pillars of the health system, namely: governance, funding, human resources, health products, vaccines and technology, health information system, and services. The evaluation team placed a particular focus on the impact of population growth on health system outcomes, which is a central challenge for Mali in the years to come. The initial results of the evaluation, presented in a preliminary report, were submitted to a broad audience of national, regional and local health officials, as well as to development partners, representatives of the voluntary health sector, civil society, and the private sector. In July 2016, two major workshops were held in Koulikoro (regional workshop) and Bamako (national workshop). In addition to these workshops, high-level exchanges were held with the Ministry of Health’s senior management. These exchanges made it possible to clarify the methodology, the scope of the evaluation, and to answer specific questions posed by participants. This validation process enabled the many actors and partners of the Malian system to take ownership of the strengths and weaknesses, challenges and opportunities facing the health system. It also enabled them to take ownership of the recommendations of this evaluation, which were the subject of an action plan and an implementation roadmap.